One of the coolest things about working at awe.some (in addition to the team, and the view ) is seeing all the exciting things our customers are doing with our platform. That’s especially true of our friends at Topspin Media, who have made us a part of projects for some of our team’s favorite artists, like the Beastie Boys, Yeasayer, and in Tilly‘s case, Kreayshawn . But for several of us, having what we’ve built be an integral part of the amazing and amazingly successful direct-to-fan release of the Bones Brigade documentary made our jobs cool to our 12 year-old selves. Personal satisfaction aside, this project and the data that the filmmakers and Topspin will be sharing at Sundance this week are nothing short of a revolution in film distribution. If you’re into the business of content, you should read more about the overall release on Topspin’s blog. The quick summary is that through an innovative combination of viral marketing, well-designed windowing, and creatively tiered pricing the producers were able to build an email list from 0 to more than 46,000 fans in just 2 months and ultimately make nearly 4 times the money they were offered in a conventional distribution deal. 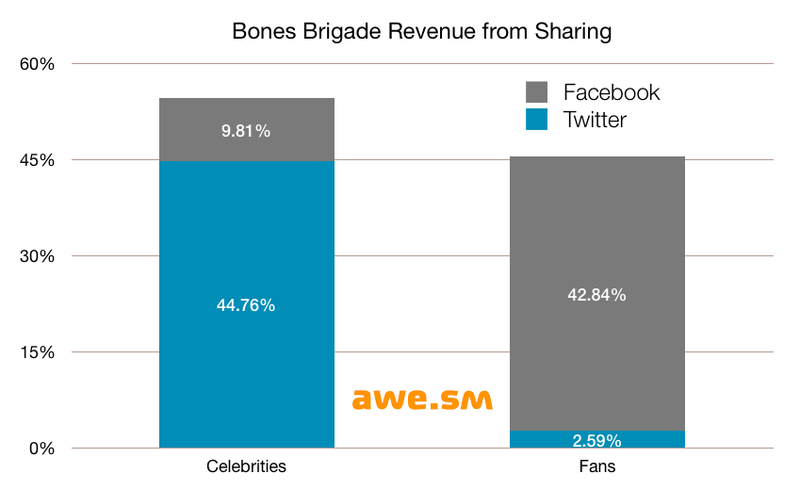 Sharing drove 10% of the total revenue from the release. And thanks to deep awe.some integration excellently implemented by the experts at The Uprising Creative, we tracked the value generated by each individual Tweet and Facebook post. 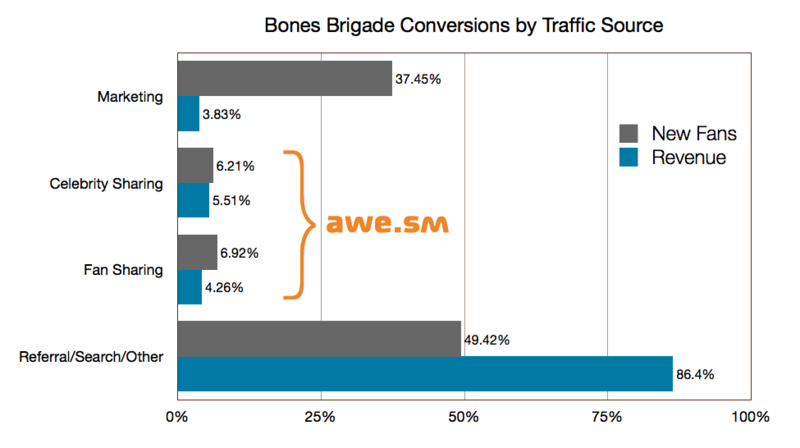 Measuring the ROI of sharing is what awe.some was built to do, and we have fascinating data on conversions from sharing across our hundreds of customers. But the unprecedented transparency of the Bones Brigade filmmakers is allowing us for the first time to publicly share some of the incredible insights we deliver our customers everyday. Topspin’s strategy was to use the existing fan-bases of the Bones Brigade members, including Tony Hawk’s 4.2m Facebook fans and 3.3m Twitter followers, to get the word out to the core most passionate fans first and then encourage those fans to spread the message to their friends. This approach was extremely successful in driving a significant volume of high-value traffic with an average value of $1.59 per visit ($2.11 per visit from sharing by the cast and $1.21 per visit from sharing by ordinary fans). Being able to track the value of each share and the relationships between shares gives you visibility into the mechanics of how and why sharing is effective and not just the end results. This is essential to understanding the patterns of success and how to replicate them. Sharing by the cast to Twitter drove more than twice as many visits per share as Facebook and more than 2.5 times the visits per fan/follower (1.10% eCTR for Facebook vs 2.82% eCTR for Twitter). Twitter followers are more likely to click than Facebook fans – Whether it’s an impact of NewsFeed Optimization or just a side-effect of the fact that normal people are primarily using Facebook to share with and consume from their friends and family, the numbers show that celebrity sharing to Twitter is driving over 2.5 times more visits per follower than sharing to Facebook is driving visits per fan with a roughly equal value per visit. We’ll be taking a deeper look at each of these topics in upcoming blog posts. So follow @awesm on Twitter to learn more about this amazing campaign. « You’re so awe.some and you don’t even know it.